Cheese graters, cowbells, gourds filled with beans. These are just a few of the "musical instruments" that Ipswich Spanish students had a chance to play with Grupo Fantasia last Friday on the Performing Arts Center stage. Director Angel Wagner and most of the other musicians on stage came from Caribbean countries. The focus that afternoon was on the music of three islands - Cuba, Puerto Rico and the Dominican Republic. 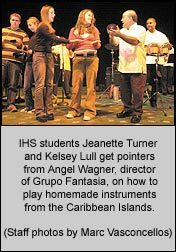 Wagner's wife Karen, familiar to Ipswich students as a substitute teacher, was on stage that day introducing musicians and explaining the unusual percussion instruments, which she called "indigenous" because of their humble beginnings. African slaves came to the islands with instruments from their countries, but plantation owners destroyed them. So the slaves began making music with bits and pieces they could scavenge on the farms they worked. Maracas were fashioned from dried cowhide and gourds filled with seeds and nuts and beans. Wooden blocks became drums. Canisters with ball bearings inside made a different sound. Karen Wagner introduced the musicians: percussionists who played drums as well as the homemade instruments, and a keyboard player from the Dominican Republic, a bass player from Trinidad, and a sax player from Japan who had clearly taken to Latin music in a big way. Wagner provided running commentary as the musicians moved from the Cuban sound to the salsa music of Puerto Rico, to the merengue of the Dominican Republic. Students were invited to join the musicians on stage, first to play the instruments and later to dance. In Spanish and English, Wagner explained the dance steps. The merengue, she says, combines a small shuffling step that originated when the slaves were shackled in ball and chain, and a looser waltz rhythm for the top of the body learned from watching their owners who came from Germany. Students in grades 8 through 12 were learning Spanish, getting a taste of the Latin culture of the Caribbean, and having fun at the same time. Volunteers joined Grupo Fantasia on stage with enthusiasm and showed their enthusiasm with clapping to the music and at the end of the hour-long performance. Karen Ferris, a Spanish teacher at Ipswich High School who organized the event, said the program was made possible in part by a grant from the Ipswich Cultural Council, a local funding group supported by the Massachusetts Cultural Council.